Diva Devotee: [Music Video] Rihanna - "FourFiveSeconds"
[Music Video] Rihanna - "FourFiveSeconds"
Anyone who's seen the promo pic for Rihanna's FourFiveSeconds knew what was coming from its accompanying video. 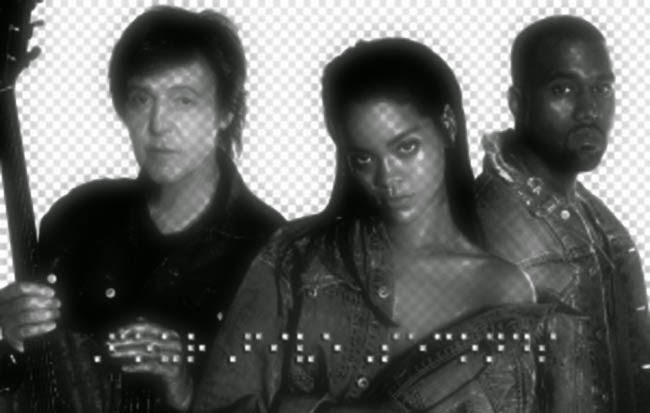 Echoing the simplicity of the track, the visuals come clean and simple, with guest stars Kanye West and Paul McCartney joining Rih in her black and white vista. Totally sympathetic and perfectly appropriate as the video is, I don't think the replay value is there for me- which isn't the case with the song itself. But I'm glad to see gimmicks aren't being employed to try and push FourFiveSeconds, allowing the song to fly or flop on its own merits. A brave move considering how against the top-40 grain it goes. More exciting to me than the video getting a release today is the news that the Diva is performing the track at this year's Grammys! And since the song sounds to be entirely within Rihanna's comfortable range, I'm hoping it'll be a good'un.